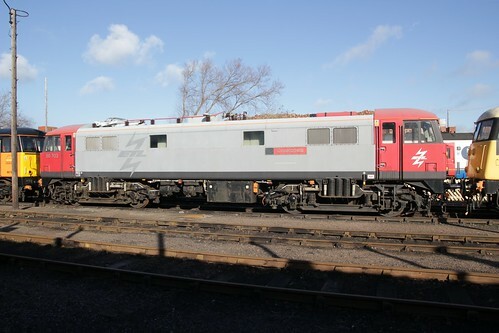 ETL liveried class 86 86702 "Cassiopeia" stored at Barrow Hill during the "East Coast Giants" event on 7th February 2014. 86702 was formerly 86260 "Driver Wallace Oaks GC", and prior to that 86048 and E3144. These days it is owned by Europhoenix Ltd. and stored pending export or a suitable spot-hire contract.